OCEANSIDE (AP) — Another “sea serpent” has attracted gawkers on a Southern California beach. This time the rare, snakelike oarfish washed up during the afternoon on Oct. 18, in Oceanside. 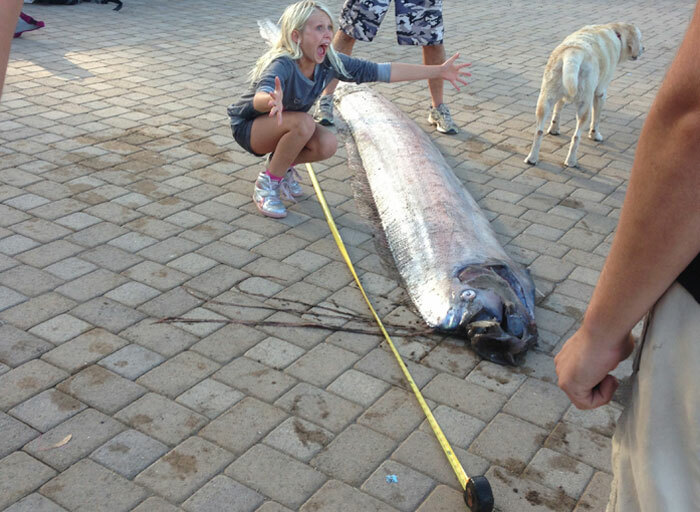 U-T San Diego reported that this oarfish measured nearly 14 feet in length and attracted a crowd of up to 75 people when it washed up on the beach. Oceanside police reportedly contacted SeaWorld San Diego, the Scripps Institute of Oceanography and the National Oceanic and Atmospheric Administration (NOAA). Someone from NOAA retrieved the carcass, which was cut into sections for later study. While it is unusual to spot of these deepwater fish — let alone find one near shore, this is the second time in the past week that one has surfaced. On Oct. 13, a snorkeler off Catalina Island found an 18-foot-long oarfish and dragged it ashore with the help of a dozen other people. According to the Catalina Island Marine Institute, oarfish can grow to more than 50 feet in length, making them the longest bony fish in the world.